Tel Vos Magister is an epic Intelligence creature card. It is part of the Houses of Morrowind expansion. "Perhaps we can help one another." "Sorry it had to come to this." The card's ongoing ability was previously "At the end of your turn, you gain a Ward", until this was changed in patch 1.72.4. The card is named for Tel Vos, which first appeared in Morrowind, and later reappeared in ESO. 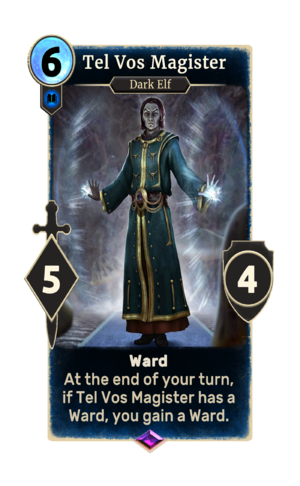 The card's art depicts Aryon, who first appeared in Morrowind as Tel Vos's magister. This page was last modified on 1 March 2019, at 23:58.